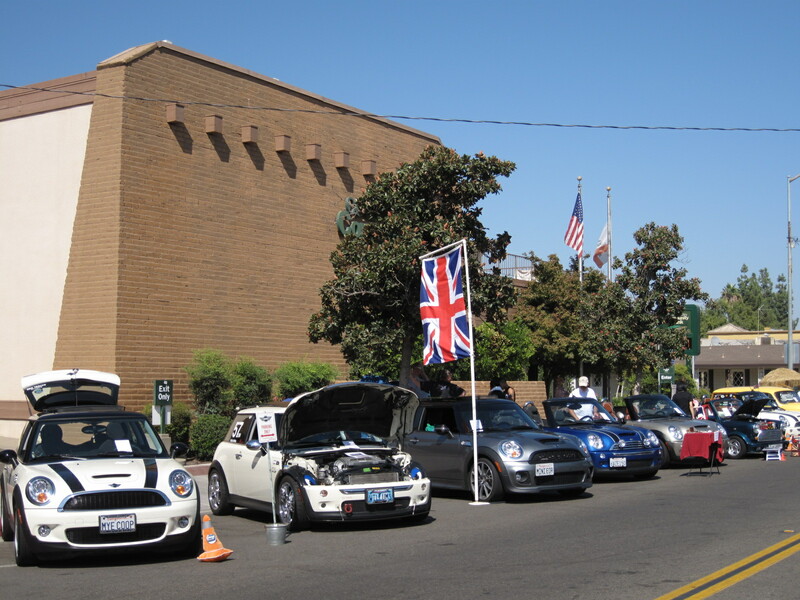 September 28th and 29th, members of MidCal MINIs participated in the annual Clovis British Car Round Up. Sponsored by the Valley British Auto Club, this group celebrates the British car hobby in the Central San Joaquin Valley. Celebrating its 11th Anniversary, this event continued its tradition of offering car enthusiasts the opportunity to see up close and personal, British cars from around the state. Cars built in England like Triumph, MG, Jaguar, Healey, Range Rover, Austin, Morris, Sunbeam, Riley, Lotus and of course MINI/Mini Coopers were all out for a day of friendly competition. The car show was held in conjunction with the annual Clovis Antique and Collectibles Fair and provided attendees with plenty to see and do. 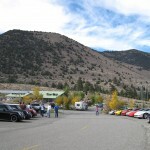 The entry fee into in the British Car Roundup is also used to help support the construction of the ‘Nature Education and Wildlife Rehabilitation Center near Clovis, CA. The Nature Center will provide residents and students from all over the Valley with a unique nature experience within a suburban setting. 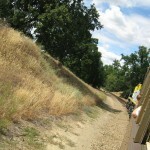 The two-day event started on Saturday September 28th with a group tour and Run through the Sierra Foothills. At noon a catered lunch was served with a short program about the Nature Center. One hundred percent of the luncheon event proceeds benefited the Clovis Valley Nature and Education Center. At 7:00 pm there was a “meet up” no-host dinner at Yosemite Falls Cafe in Clovis. Check here for more pictures of the 2012 great event including pictures of the MidCal contingent and here for a Video and Slide Show of the event. 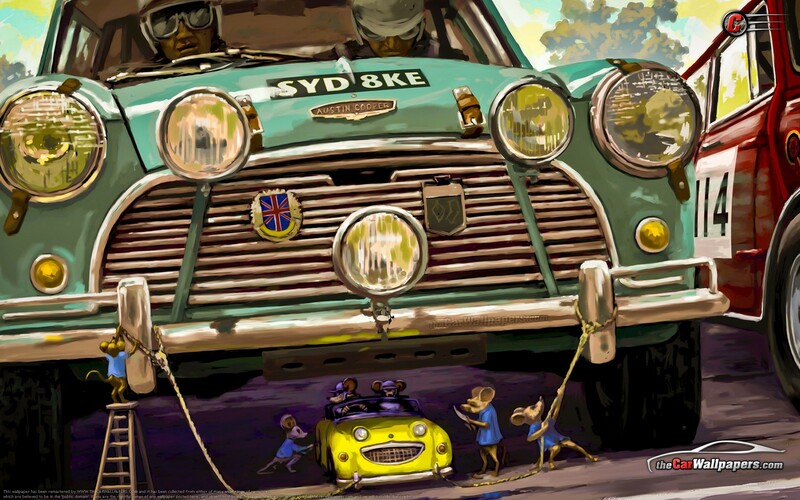 It is time once again to put some spit and polish on your MINI and join in on an annual MidCal tradition, participation in the annual Clovis British Car Round Up. 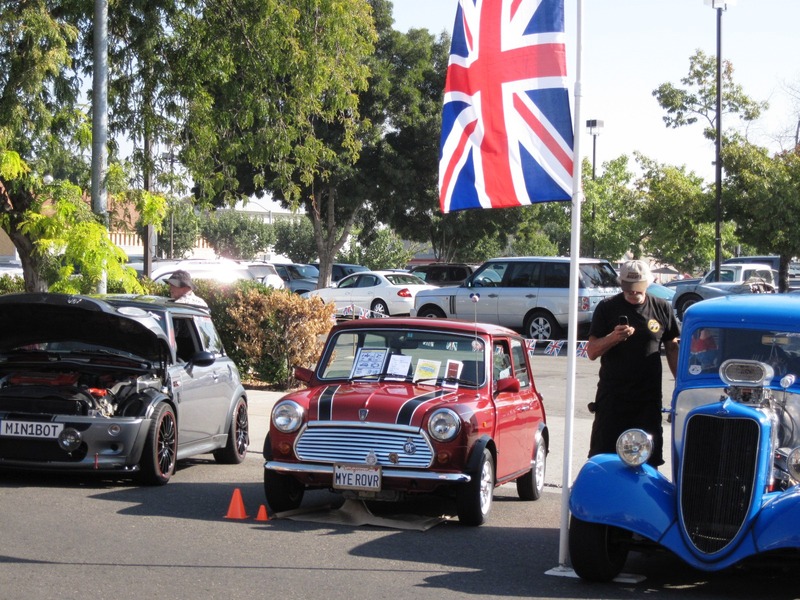 Sponsored by the Valley British Auto Club, this group celebrates the British car hobby in the Central San Joaquin Valley. This is the only official car show entered into by the MidCal group and the Car Roundup is held once a year on the last weekend in September. Celebrating its 11th Anniversary, this event continues its tradition of offering car enthusiasts the opportunity to see up close and personal, British cars from around the state. Cars built in England like Triumph, MG, Jaguar, Healey, Range Rover, Austin, Morris, Sunbeam, Riley, Lotus and of course MINI/Mini Coopers all out for a day of friendly competition. The car show held in conjunction with the annual Clovis Antique and Collectibles Fair provides attendees with plenty to see and do and is enhanced by the number of restaurants, coffee houses, live music and exceptional antiques and collectibles all within walking distance of the car show. Like last year, MidCal encourages participation in the Foothill Run on Saturday September 28th in addition to the Car Show on September 29th. 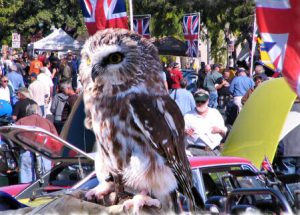 The entry fee into in the British Car Roundup is not only a ticket to a great weekend of British Car fun but is also used to help support the construction of the ‘Nature Education and Wildlife Rehabilitation Center near Clovis, CA. The Nature Center will provide residents and students from all over the Valley with a unique nature experience within a suburban setting. We live in an area rich in natural beauty but the travel distance to participate in or observe nature excludes many from these experiences. When this project reaches full development, individuals and families may observe the beauties of this region in a natural state without lengthy travel and large expense. The two-day event starts on Saturday September 28th at 9:00 am in front of the Clovis Cole Hotel for a group tour and Run through the Sierra Foothills. At noon a catered lunch is served with a short program about the Nature Center. One hundred percent of the luncheon event proceeds benefits the Clovis Valley Nature and Education Center. At 7:00 pm there is a “meet up” no-host dinner at Yosemite Falls Cafe in Clovis for old and new friends to enjoy time together. Sunday, September 29th, the Car Show kicks off from 9 am to 10 am for registration. The arrival location is new this year and is at Bullard and Woodworth so be sure to click on the registration link below for an entry form and check-in map. Drivers are instructed to park their cars in assigned areas by marquis and model. From 10 am to 2 pm, British car viewing and treasure hunting at the Clovis Antique and Collectables Faire is held. A favorite event, Oil Spot Judging also takes place during this time. 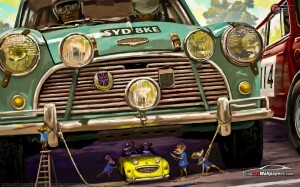 New MINIs fortunately simply cannot win this event as they refuse to leak oil! 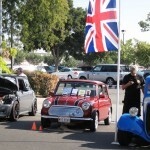 MidCal MINIs did however have several event winner’s last year, one was even a repeat winner. 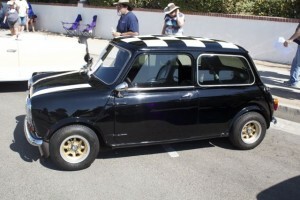 A third place Oil Spot winner in 2011, Reggie, a 1995 Classic Mini took first place in 2012 for best display of oil drips. Ordinarily this would not be a good thing. Reggie however had a temperamental oil filter and even though his gasket had been changed and tightened several times, he appeared to have saved up so as to make a “big splash” for this event. Looks like he could use some depends too! This year however, Reggie is out of the running as he has mastered holding his oil! In July of 2011, Reggie went from a seldom driven little hobby car sold on eBay to a very much-loved member of a MINI family. He made his brother and sister, Coopster and MINImowse very proud indeed. Thanks of course went to the MidCal cheering section that ensured Reggie’s Oil Drip victory. First place by the way garnered two gallons of engine oil; obviously something that Reggie accepted proudly and most definitely used! An added and unexpected treat was Reggie taking Second Place in the Winner’s Circle in 2012. Not too bad for a little British car who spent his formative years in Japan and his first few years in the USA seeking a true Mini lover. 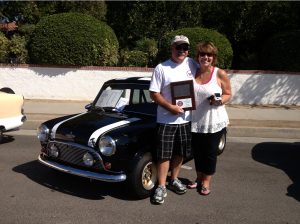 Jon Brother’s and his Classic Mini, also members of MidCal, took First in Class. Jon and his Mini were fairly newly acquainted in 2012. After a lengthy search and “an endless obsession” according to Jon, to read everything there was to find out about the Classic Minis, Jon found a Mini to make his own. It is a very brilliantly done Cooper S replica . His car was fully restored, and Vintage Race prepared, by a known racer in Northern California in 1995/1996. The car had approximately 3,500 miles on it since it’s rebuild. It has a CSRG log book, with the last entry having been made in 2001. Races were logged at Thunderhill, Sears Point and Laguna Seca. Congratulations, Jon, Joanie and their special Mini. You don’t want to miss this fun event, so click here to find the registration form and more information. All registrations are due no later than September 26th but to be safe, get them in by September 20th. Let’s have another great turnout this year MidCal and let’s kick some boot! See you there. 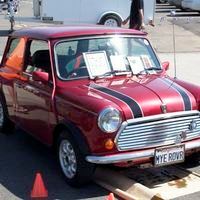 MidCal MINIs is planning one of its favorite runs; the Morro Bay / Paso Robles Run. 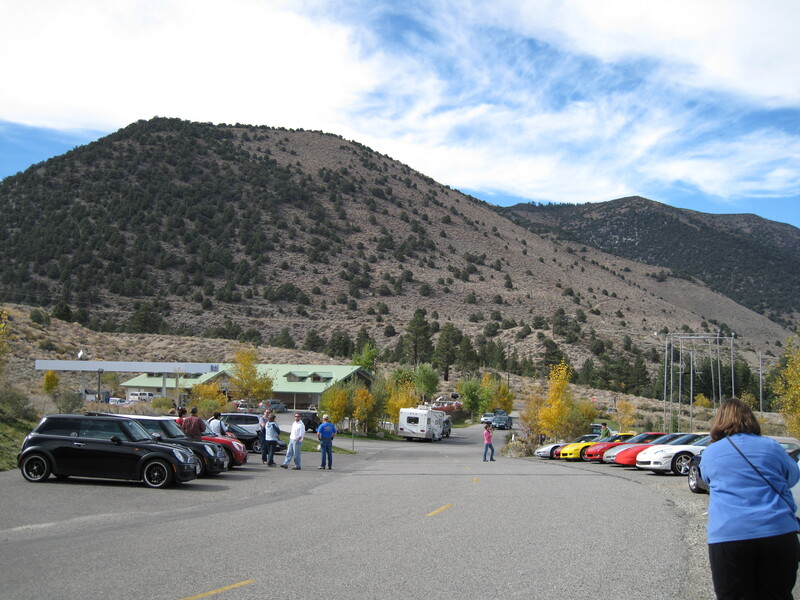 As in years past, the group of MINIs will head over to the coast by taking Highway 41 to the twisties on Highway 46 and then stop at Rotta Winery for some wine tasting. The date has been set for September 14th with the band of merry MINIs departing the Starbucks at 41 and Shaw at 8:00 a.m. The group will begin assembling at about 7:45 a.m. to coordinate the route and to set walkie talkies on the same frequency. (These are important when traveling in a large group as it helps to keep us together, so don’t forget yours!) We will arrive at the Winery at approximately 11:00 a.m. Upon arrival, there is a $5.00 wine tasting fee and this year lunch will be a BYOL (Bring Your Own Lunch) unless w e are able to set up a caterer or make arrangements to pick up sandwiches at a nearby Subway. Food is still up in the air but updated information will be posted at it becomes known. Watch this site for more information. RSVPs will be needed no later than September 9th. Rotta Winery, in Templeton California is located west of Hwy 101, just south of Hwy 46, at 250 Winery Road. The group spends several hours at the winery and then it is every MINI for itself. Several of the MINIs in the past have headed over to Cambria, Morro Bay, Hearst Castle and other nearby locations for the night and to take in some local sites and events, while oth ers have heads back home. Rotta Winery, founded in 1908 by the Rotta Family, is the only remaining family owned “original” winery in San Luis Obispo County. Mike Giubbini, grandson to the Rotta Family and Mark Caporale of Napa, combined their talents to “bring back to life” the historic and rustic winery. Today, Rotta Winery, just as in days of old, specializes in premium red and white wines along with flavorful and distinct dessert wines. The 20-acre Rotta estate vineyard has 15 acres in Zinfandel and five in Cabernet Sauvignon. For now the Rotta label is focusing on red wines such as Cabernet Sauvignon, Zinfandel, Merlot, and Black Monukka– a dessert wine and Zinfandel Port. All of the fruit for the label is being sourced from local vineyards, especially those from the Westside. 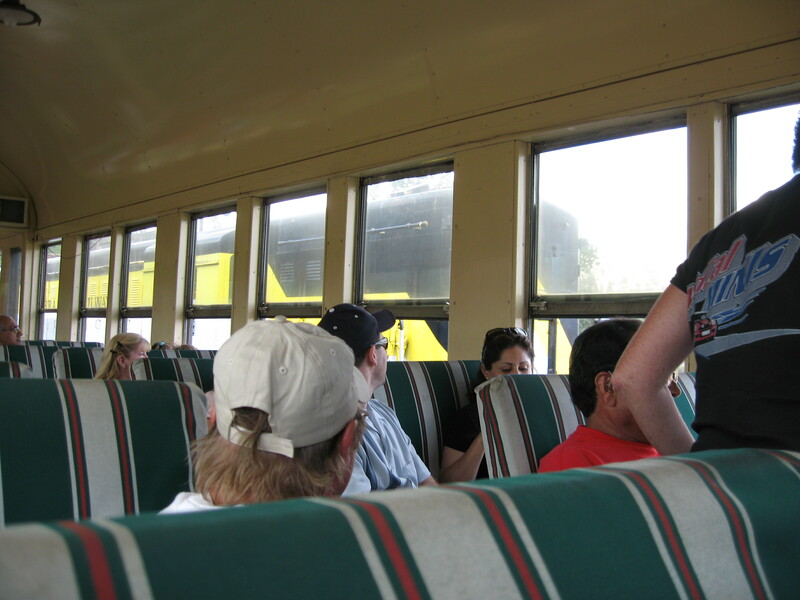 As in the past, some of the MidCal members may travel on to nearby coastal towns to spend the night. 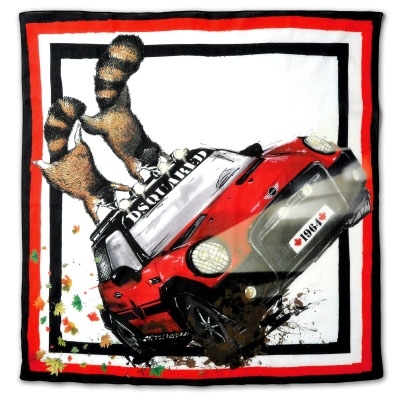 For this part of the event each MINI motorer is on their own to make travel and lodging arrangements. Nearby communities are Paso Robles, Cambria, San Simeon, Morro Bay, Cayucos, etc. 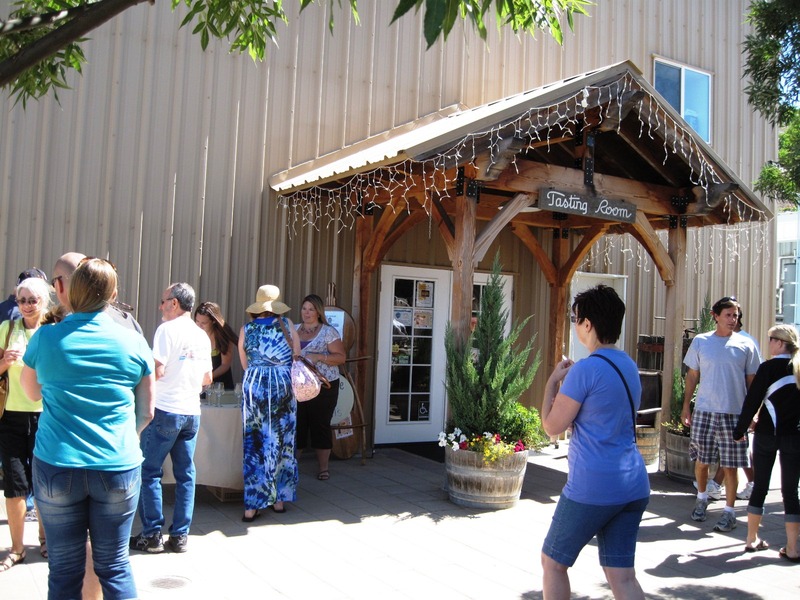 Winery Run – August or September? 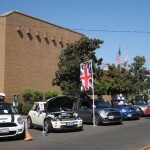 It is time for the MidCal MINIs to plan one of its favorite runs; the Morro Bay / Paso Robles Run. Like last year, the group of MINIs would head over to the coast, most likely by taking Highway 41 to the twisties on Highway 46. 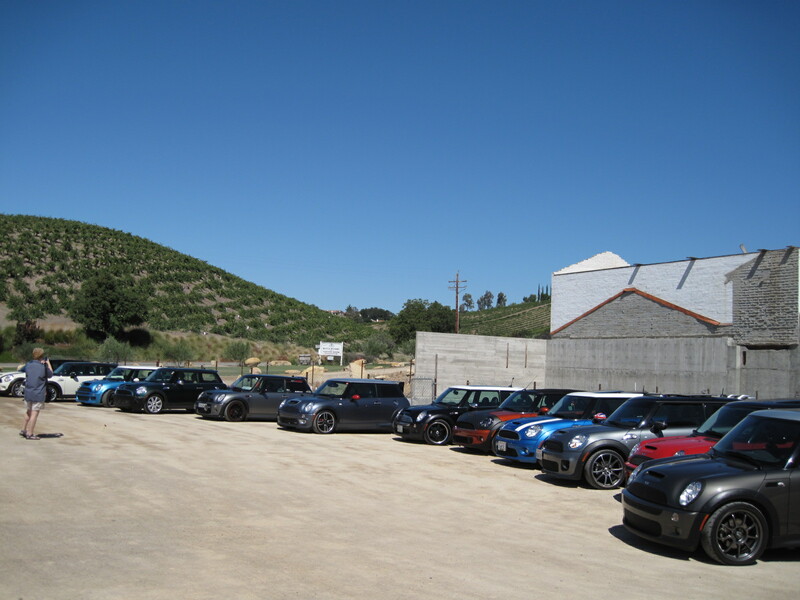 If possible, the band of MINIs would like to stop for lunch at Rotta Winery. This run is in the discussion stages so be sure to attend the MidCal meeting on August 9th or 23rd (date yet to be set) to put in your two cents worth. Rotta Winery, in Templeton California is located west of Hwy 101, just south of Hwy 46, at 250 Winery Road. 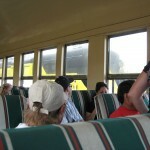 Last year’s run included a Winery Tour, wine tasting and a catered box lunch for all participants. Upon arriving at the winery the MINIs were greeted by host and winery owner Mike Guibbini who led a tour of the operations. After a great afternoon, several of the MINIs headed over to Cambria, Morro Bay and other nearby locations for the night and to take in some local sites and events. Rotta Winery, fo unded in 1908 by the Rotta Family, is the only remaining family owned “original” winery in San Luis Obispo County. Mike Giubbini, grandson to the Rotta Family and Mark Caporale of Napa, combined their talents to “bring back to life” the historic and rustic winery. Today, Rotta Winery, just as in days of old, specializes in premium red and white wines along with flavorful and distinct dessert wines. The 20-acre Rotta estate vineyard has 15 acres in Zinfandel and five in Cabernet Sauvignon. For now the Rotta label is focusing on red wines such as Cabernet Sauvignon, Zinfandel, Merlot, and Black Monukka– a dessert wine and Zinfandel Port. All of the fruit for the label is being sourced from local vineyards, especially those from the Westside. Get away from some of the heat of the Valley and join us for a run through the local foothills on Saturday, July 13. We will travel through the North Fork and Auberry areas. Tina will have maps for those of you who want to take this drive. The run time would be roughly 2.75 hours without stops, however 3 stops are planned; 2 potty breaks and one photo op, so it will be a bit longer. This is a repeat of last year’s run when the road was under construction, however, Tina has been assured that all construction is over and done with. It was a beautiful and fun run with lots of twisties. When: Saturday, July 13 @ 9:00 am. (A group lunch after the run is possible if the group is interested). What to bring: Walkie Talkies and Water!!! 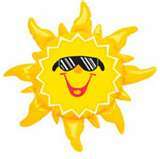 It will be hot!!!! What’s on your Calendar in June? The Club Run/Event for June 2013 has yet to be determined, so what’s on your calendar MidCal MINI members? What would you like to do? Where would you like to go? Email Tina at mcm@MidCalMINIs.org with your thoughts, ideas and suggestions. Get away from the heat by planning a run or event to the mountains or the coast; or what about bar-b-que at Woodward Park? How about a local event with a trip to the Underground Gardens where it is cool even in the local heat? Or support local history with a MINI visit to the Meux Home with lunch following? A return visit to the RaceRoom is also an option. Send in those thoughts and suggestions. The first Club Run for 2013 has hit a target and has been scheduled for April 13th and is one of the Club’s favorites, an annual run to Jamestown, CA. This historic gold mining town dates back to the 1840’s. A walk down Main Street in Historic Jamestown is a step back in time. A few blocks east of the historic downtown area is the State park Railtown. 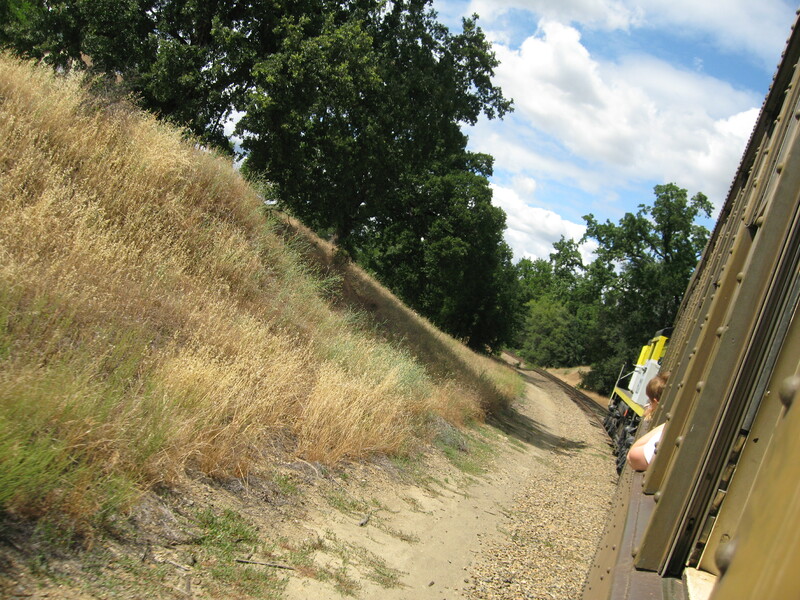 This park has preserved much of the Sierra Railway, built in 1897 to link the very isolated areas, at that time, to Oakdale and the rest of the rail network. The line carried lumber from sawmills in Tuolumne City and Standard to the outside world. It also carried quartz ore to processing plants in the Bay Area where the gold was then extracted. You can see today evidence of the rich history of Jamestown, in the architecture of the buildings and homes along Main Street, at Railtown 1897, the state park that has preserved the turn-into-the-20th century beginnings of the steam Sierra Railway, and at Woods Crossing, the gold discovery site just west of town. This was in the early summer of 1848, a few months after the famous gold discovery at Sutter’s Mill that started the Gold Rush, about a hundred miles north of here at Coloma. Miners quickly came to the area, and for years afterwards, Woods Creek was filled with miners washing dirt that they dug out of the creek, seeking flakes or nuggets. Many made significant finds in that first year. The gold at Sutter’s Mill was discovered in January of 1848 and Sutter initially tried to keep it secret. This failed, and a large proportion of the settlers then in California traveled to the Gold Country to mine. However, that year–when the gold was easiest to find–mostly involved those already in the West. Although accounts of the gold discovery were published in Eastern newspapers, they were not widely believed, and it took time to get to California from the east. Finally, in December of 1848, President McKinley made a speech to Congress about the gold discovery, having received rich samples. In 1849, the mass migration of miners from the east began, by wagon, by ship around Cape Horn or in the two-stage ship journey via the jungles of Panama. Jamestown, like many other such towns, went through a succession of booms and busts. Many towns in the area simply disappeared after the easy pickings of the Gold Rush ended. Jamestown survived, going through two major boom periods, although both eventually fizzeled out, and it never grew as large as its bigger sister, Sonora, which became a business and government center and also sustained itself after the placer mining ran out by rich underground “pocket mines” beneath the city. Jamestown was named for a man named Col. George F. James, a flamboyant attorney who came here from San Francisco with an entourage. He set up shop in a tent near Woods Creek and sold groceries, mining equipment. He became the town’s first alcade, a sort of combination mayor, judge, city clerk, and advisor to all that was part of the Mexican legal system in force at the time. James persuaded the town’s population to invest in various schemes that did not pan out, and disappeared overnight, leaving many unhappy residents. Go to the Club Events link for more information. 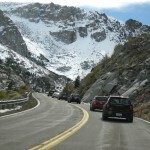 UPDATE – While the Tioga Pass/Whoa Nellie Deli Run has long been a favorite of the MidCal MINIs, it is not to be this year. 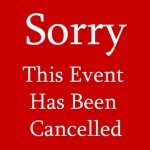 The tentative dates selected, which had been Saturday, October 20th or 27th did not generate a great response. The economy, gas prices, the length of the run, other commitments, all may have played a part this year. Not to fret, there is always next year. Don’t forget the Monthly Club Meeting this Friday, October 19th at Yosemite Falls Cafe at the corner of Cedar and Dakota (Granite Park). See you there at 6:30 sharp. Email Tina at mcm@midcalminis.org with your RSVP for the Club Meeting. 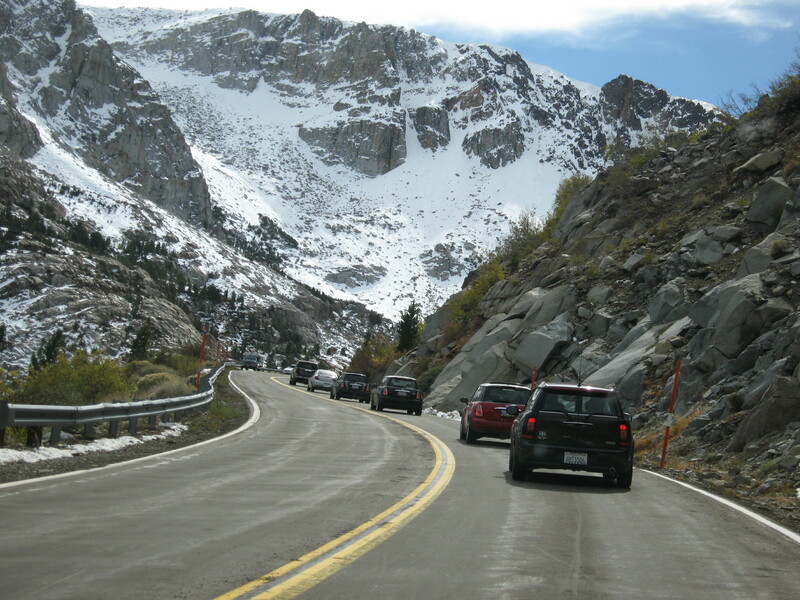 Saturday, October 20th or 27th has been selected as the tentative dates for the annual Tioga Pass Run to the World Famous Whoa Nellie Deli. If you have not had the pleasure to take this trip, mark you calendar now. The Fresno contingent will meet at Starbuck’s at Shaw just east of 41 at 7 am. At 7:30 am sharp, the group will leave to caravan to the second meeting location in Oakhurst and will rendezvous at about 8:00 – 8:15. The Oakhurst meeting location is the Raley’s Parking lot on the corner of HWY 41 & HWY 49. After a brief pit stop, the expanding caravan will head back onto 41 and take the scenic drive through the edge of Yosemite National Park. Upon entering the park and paying the $20 entry fee it will be on to Tuolumne Meadows and over Tioga Pass into the town of Lee Vining and the Famous “Whoa Nellie Deli”! The Whoa Nellie Deli is located in a Mobil gas station on a hilltop just west of the intersection of U.S. Route 395 and California State Route 120, one mile south of the business district of the small town of Lee Vining, California. (22 Vista Point Road, Lee Vining CA.) Geographically, this location is where the eastern edge of the Sierra Nevada meets the western edge of the Great Basin. Mount Dana and other High Sierra peaks are visible to the west. The eastern entrance of Yosemite National Park, located at Tioga Pass, is 12 miles to the west. Mono Lake, a uniquely salty and mineral saturated body of water, is visible from the restaurant to the northeast. 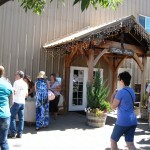 The gas station also offers a gift shop, a small grocery store, and picnic facilities. Live musical performances are featured about 30 times each year from late spring to early autumn, usually on Thursday and Sunday evenings. The restaurant is closed in the winter. service. Whoa Nellie Deli Review by Frommers – What looks to be an ordinary gas station is home to a truly extraordinary eatery that serves thousands of people on summer days. Inside the Tioga Gas Mart — aka “The Mobil” — chef Matt “Tioga” Toomey offers some of the most tantalizing plates in the Sierra Nevada, as well as plump to-go sandwiches and pizzas. We recommend you take a seat in a booth or on the popular patio and enjoy the mind-blowing cuisine before moving on. The menu includes fish tacos with mango salsa and ginger slaw, pork tenderloin with apricot-berry glaze, and wild-buffalo meatloaf with garlic mashers. We especially like the lobster taquitos with tomatillo salsa — and the transcendent chocolate cake. All of the plates overflow with excellent salads and heaps of fresh fruit, making the deli the best post-backpacking eatery in the area. Email Tina at mcm@midcalminis.org with your preference. 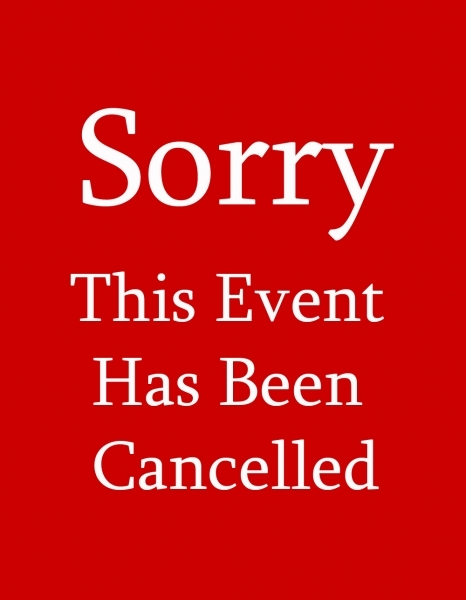 This is a long run and participation has been dwindling over the past few years, so if not enough RSVP’s are received the run will be cancelled.